Production: Nordisk Films Kompagni; black and white, 35mm, widescreen; running time: 94 minutes; length: 2565 meters, or 8460 feet. Released 16 November 1966, Copenhagen. Filmed in Denmark. Producer: Bo Christensen; screenplay: Klaus Rifbjerg; assistant director: Tom Hedegaard; photography: Claus Loof; editor: Ole Steen; sound: Niels Ishsy and Hans W. Søensen; art director: Henning Bahs; music: Chopin, Beethoven, and Leo Mathisen; costume designer: Lotte Dandanell. Madson ( Jane ); Christian Gottschalck ( Grandfather ); Yvonne Ingdal ( Lis ); Karen Marie Løwert ( Lis's mother ); Gregers Ussing ( Frank ); Jan Heinig Hansen ( Markus ); Birgit Brüel ( Markus's mother ); Jørgen Beck ( Friend ); Elsa Kourani ( Friend's wife ); Henry Skjar ( Headmaster ); Holger Perfort ( Teacher in gymnastics ). Rifbjerg, Klaus, and Palle Kjaerulff-Schmidt, Der var engang en krig , Copenhagen, 1966. Stormgaard, Uffe, and Soren Dyssegaard, Danish Films , Copenhagen, 1973. Passek, Jean-Loup, editor, Le Cinéma danois , Paris, 1979. Variety (New York), 30 November 1966. Hollywood Reporter , 2 November 1967. Film Quarterly (Berkeley), Winter 1967–68. Today's Cinema , 13 June 1969. Monthly Film Bulletin (London), August 1969. Films and Filming (London), September 1969. Semprun, Jorge, and Palle Kjaerulff-Schmidt, in Chaplin (Stockholm), no. 3, 1976. Monty, Ib, "Danish Film," in Factsheet Denmark , Copenhagen, 1983. Film Dope (Nottingham), January 1985. Schepelern, Peter, in Kosmorama (Copenhagen), Summer 1987. Apart from Carl Th. Dreyer's Gertrud, Der var engang en krig is the most important Danish film of the 1960s. It is a portrait of a 15-year-old boy from middle-class Copenhagen during the German occupation. The German occupation of 1940–45 has been described in several documentaries, most notably in the unique Your Freedom Is at Stake , based on illegally shot material and reflecting the views of the resistance movement—a view quite critical towards the official Danish collaboration policy. Sixteen feature films were inspired by this important period in recent Danish history, most of them stressing the heroic aspects of the resistance. Contrary to this approach, Der var engang en krig uses the war as a background, but reflects the daily life of the Danes in a more authentic and honest manner. The film is structured as a chain of incidents, showing the boy in relation to family, friends, teachers, and girls. The main story centers on the boy's love for one of his older sister's girlfriends. To her he is a boy, to him she is the object of his adolescent dreams. He fantasizes about her, seeing himself as a resolute hero in a number of daydream sequences, which are among the most problematic scenes in an otherwise beautifully controlled film. It is based on a meticulous care for authentic detail, and its intensity of feeling grows out of these carefully recollected views of the past. Though visually it can be considered within a realistic tradition, it is the situations, the excellently written dialogue, the characters, and the way it brings a period to life which make the film engaging and emotionally rich. 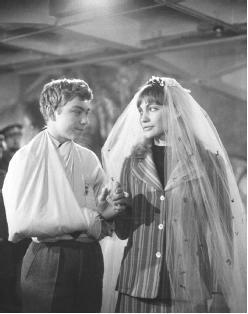 The film is not without humor; but as the narrative is from the boy's point of view, he is never presented in an ironic way. The stronger feelings are condensed in the long travelling shots and pans, when the boy is cycling, expressing his feelings in physical activity. The film was written by Klaus Rifbjerg who, like Palle Kjaerulff-Schmidt, the director, takes advantage of personal experiences to enhance his work. Rifjberg is the finest poet and author of his generation, and he and Kjaerulff-Schmidt started collaborating on films in 1959. In 1962 they made Weekend , a study of young adults and their emotional problems. Weekend was considered one of the films heralding a new, more modern era in the Danish cinema. Reality has finally returned to the Danish film after a long barren period. The collaboration between Rifbjerg and Kjaerulff-Schmidt culminated with Der var engang en krig , their finest achievement and one of the highlights of contemporary Danish cinema. Influenced by Truffaut (especially The 400 Blows ) and similar to films by Ermanno Olmi and Milos Forman, Der var engang en krig represents the best in intimate realism. The film was received very well by Danish critics and also got very fine reviews abroad, especially in England.